This past Christmas, Little a gave me one of my all-time favorite gifts. Presented in a small, decorative holiday box were five little bottles of gel food color, five little pots of gorgeous luster dust, and one little pot of hot pink disco dust! The gel colors were a great addition to my colorful collection, but I did not own a speck of luster or disco dust. Although I wasn’t quite sure how to use it, I knew its purpose was to provide sparkle and accent to cake and cookie frostings, and my heart skipped a beat!! Because I was impatient and wildly excited about playing with my new “toys”, I frosted the cookies using CK Royal Icing Mix. I found it to be quick and easy to mix and apply. (Wilton makes one, too, but I’ve never tried it.) 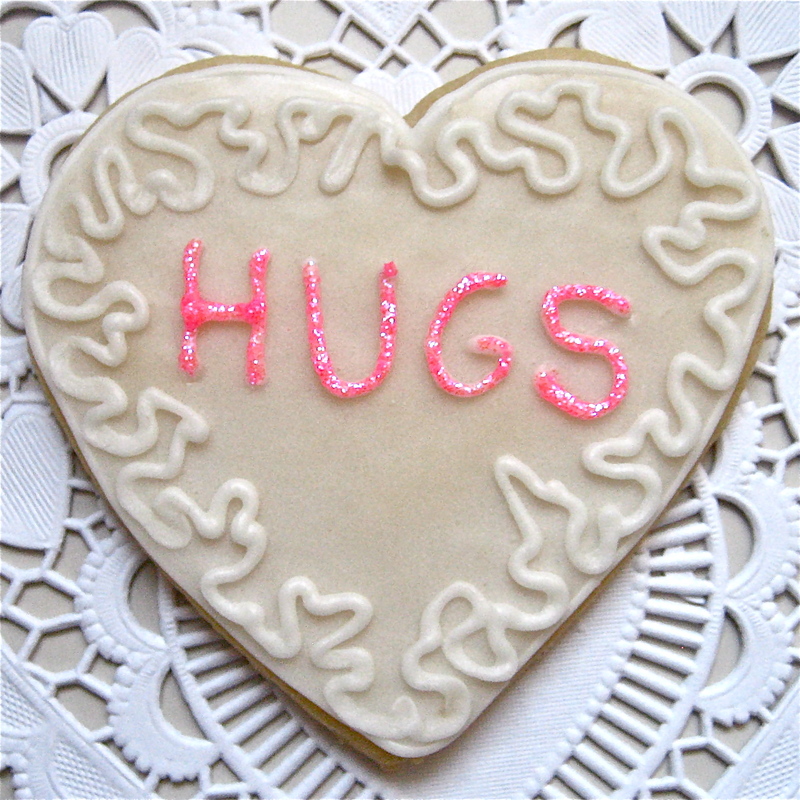 I highlighted the word “hugs” with my hot pink disco dust (all dusts were labeled non-toxic). This you-tube tutorial helped me tremendously. I used “Super Red” luster dust applied over the royal icing on the right, and I used Wilton Pearlized Jimmies (love these!) on the left. The hot pink sanding sugar and tiny heart confetti came from Williams Sonoma. Note to my husband: this does not mean that the special little boxes that you give me at Christmas should contain luster dust. No….no. Those are absolutely beautiful! I’m in awe of your artistic talent. 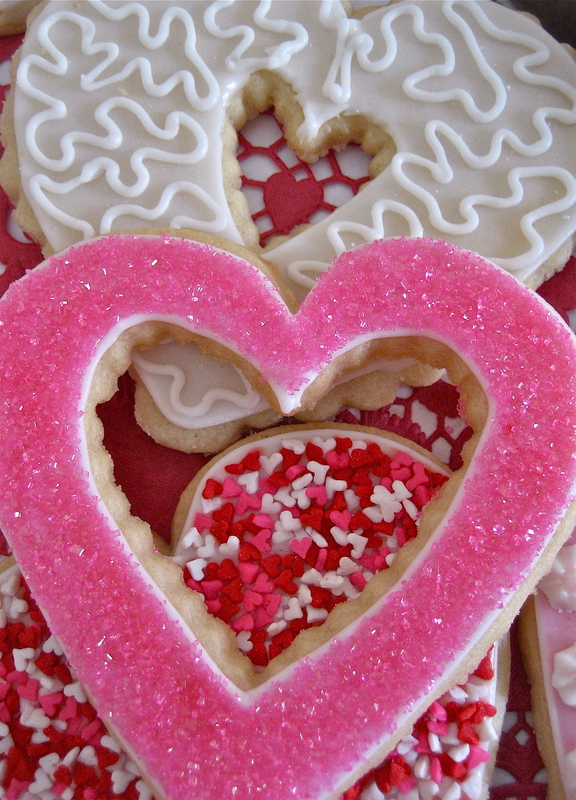 I’ve mastered baking cookies (er, well — I wouldn’t say “mastered,” but I’m competent!) but can’t decorate to save my life. My boyfriend’s mother is incredibly talented with sprinkles and icing, so I’m trying to learn a thing or two from her! Thanks for making me smile!! Ok, now I’m feeling more incompetent than EVER!! Good God Ann, is there no end to your extraordinary talents? My goodness, these look too good to eat! They are magazine worthy! Having said that, I’m coming over to snag a couple. Need 2 for my coffee in the morning! Put the light on! The light is on and your cookies are ready-to-go! C’mon over!! Beautiful!!! Love the blog title too! You’re sweet, Amanda. Hope life in Boston is treating you well!! Absolutely BEAUTIFUL!!! Almost too good to eat. ( I said almost!) You are just amazing. And you have inspired me! I will await the “bread-and-butter” pudding recipe and share a bit of Great Britain with our readers ;-) Yum! Really these are a tease. Beautiful Works of art! Day just around the corner. Oh my god!!! !, your cookies a gorgeous, they are a work of art and having tasted some of your other cookies, I’m sure they are to die for! I’ve enjoyed just poking around your site. Thanks for my 1/2 hour of fun. I’ll be back again soon. Welcome, and thanks for taking the time to check us out, Bethie! 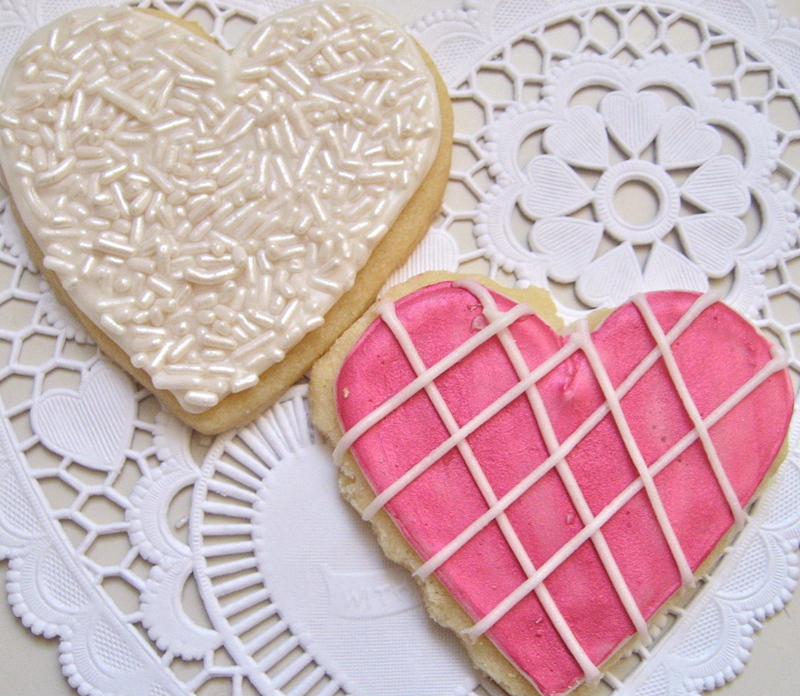 These Valentine’s cookies have gotten lots of attention, and I’ve been having fun sharing them! The consensus has been that they taste pretty good (whew!). Happy Valentine’s Day to you and big Joe…looking forward to hearing from you again….soon!